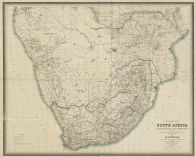 Title: Original Map of SOUTH AFRICA Containing all South African Colonies and Native Territories. Compiled from all available information, combined with the results of his own explorations by the Revd. A Merensky, Formeerly Superintendent of the Berlin missions in Transvaal.